Just a couple of weeks ago I woke in a cold sweat. However, once I realized that it was indeed just a dream that our event headliner (Gail Simmons, from Bravo TV’s Top Chef) didn’t show, I was able to relax a little. Palmetto Bluff’s Music to Your Mouth event series is a lot of work. I won’t lie. I lose sleep thinking about all of the details. In fact, once I have my first Music to Your Mouth related nightmare, I know we must be within the 90-day mark. The good news is that as we near the fourth year of the event, I have come to expect the sleepless nights. The better news is that I share the stresses and the successes with three other members of the Palmetto Bluff team—Sommelier Jason Carlen, Executive Chef Kirk Gilbert, and Food and Beverage Director Jeremy Walton. Our blooper reel is quite comprehensive. Together we’ve battled frigid temperatures. Yes, when the mercury dips below 20, shrimp will freeze on a buffet. We’ve learned that pulling all the power from one source will indeed trip the circuit and result in pure mayhem, especially when it is merely 10 minutes before the start of an event, and the band is shooting daggers from their place on the darkened stage. We’ve felt the panic associated with the “what do you mean the toilets won’t flush” moment (also 10 minutes before the start of an event). And we’ve watched while the sprinkler system blasted the interior of the 10,000-square-foot main tent, soaking everything in its wake (stage, sound system, lights and all), leaving a spectacular ice coating, due to aforementioned frigid temperatures. We’ve also watched a two-day event that started just four years ago grow into a year-long food and wine series with more than 40 events and some of the most noted chefs and winemakers in the country. I think it is fair to say that we are quite proud of what we have created. As a team, we are a force to reckoned with. We work hard. And we are hard on each other. In the end, however, we truly enjoy the camaraderie and have fun. But that wasn’t always the case. Flashback to October 2007. We were just 45 days out from the first ever Music to Your Mouth event. Jeremy had recently joined Palmetto Bluff and was walking into the event planning mid-stream. So we got together for the first time to tackle all of the looming logistics. We still have our battles, but we’re smarter now. We know each other’s personalities well enough to guess where we will each land on a topic, and we certainly play our hand accordingly—sometimes we gang up on each other; other times we accept defeat. “FOOD FEST COURTNEY” —The guys call me “Food Fest Courtney.” On the rare (cue laugh track) occasion that I get a little persnickety, I apparently morph into this alter ego. Food Fest Courtney has a little more sass (read: attitude) and an agonizingly infinite attention to detail. I can often be heard saying, “No, move the table to the left, another inch, now back, to the left again, a little bit more, no, no, no!” They won’t let me in the kitchen, so instead I handle the organizational aspects. I maintain the look, balance the books, book the travel, coordinate the vendors, court the sponsors, tout the event. And I move tables back and forth, and back and forth again, to ensure that our vision is achieved. JOLLY JUICE DIRECTOR —Jason. He makes magic. He is a certified sommelier with the Court of Master Sommeliers, but we prefer to call him the director of jolly juice. People get sauced on his good drink. He’s concocting cocktails and toiling away in his wine cellar, seeking the best and brightest stars of the wine world, enticing them all to Palmetto Bluff. And, if he can’t find exactly what he is looking for, he’ll travel to Napa to blend his own. (He unveiled Palmetto Bluff’s first Pinot Noir just a couple months ago.) Persuasion is a tool that Jason has mastered. Celebrated winemakers with standout collections travel from as far as Germany to be a part of Music to Your Mouth. He’s that good. 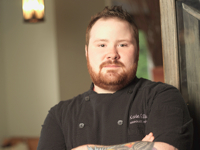 CHEF KIRK —I picture the culinary team standing behind the line saluting Chef Kirk. He commands attention. Almost stoic, he is all business. He takes his job quite seriously, which is probably why his résumé includes a Mobile Four Star rating and a guest chef stint at the James Beard House. During Music to Your Mouth, Kirk and his team provide support for nearly 30 guest chefs, no small feat. As the newest member of the team, Kirk had to elbow his way into a pretty tight trio. We’ve found that when the work is done, his quick wit keeps us all on our toes. He’s a perfect fit. 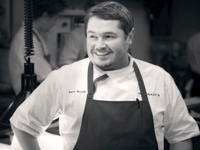 SOUTHERN COMFORTER —Jeremy is the lone southerner in the group, and he works to ensure that the traditions of the South maintain a presence at Music to Your Mouth, and on Palmetto Bluff’s menus and tables year-round. 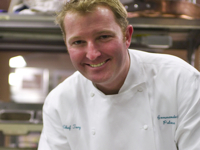 Jeremy works with our culinary team and guest chefs to coordinate the tastes of 17 event menus. But he isn’t just in the kitchen; he dives into all aspects of planning and helps build the events from soup to nuts. We’ve seen him carry tables on his back, de-lint linens, tap a keg, and polish wine glasses. He may talk a little slower than the rest of us, but he moves twice as fast. He gets the job done. We’d like to think that we put together the finest nibbles and nectars to ever tickle a taste bud. And when people ask what we want this event to become, we actually provide the unorthodox answer. We could make this the biggest food and wine event in the Southeast—heck, in the country. But believe it or not, we don’t want to. For us, it is about creating connections. You’re not just going to taste the food; you are going to talk to the chef who prepared it. The winemaker himself is often filling your glass. The farmer is explaining why his food is best for your table. All of these elements come together to create an experience that can only be described as … Music to Your Mouth. We invite you to join us at our table and become a part of our tradition. And we’ll try to make sure the bathrooms are working, the power is on, the food is not frozen, and the tent is dry. It’s the least we can do. Cheers! Experience the spectacular May River Golf Course at the LOCALS OUTING. 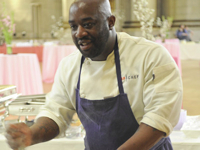 Hirsch Vineyards LEGACY “FAMILY DINNER” features sibling chefs Kirk and Kenny Gilbert. Cruise the May River abroad our antique yacht, Grace, where we’ll match the sweet with the savory on the CHOCOLATE DECADENCE CRUISE. The enlightening blind CHAMPAGNE TASTING will introduce you to some of the best champagnes, and you’ll decide where your tastes really lie. 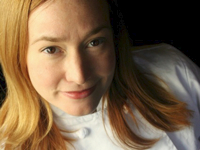 Two cork dorks will joust for dominance at the five-course SOMMELIER SMACKDOWN dinner. Join Southern Chef Chris Hastings who’ll unlock the secrets of the past and bring them to your m odern-day kitchen at this SIZZLIN’ SKILLET COOKING CLASS. The STINK AND DRINK Grace cruise features samplings of Miner Family Wines and homemade cheeses. Winemaker Dave Miner will be on board to talk about everything you taste. At the SOUTHERN SUPPER CLUB BLOCK PARTY** you’ll celebrate the small things…the simple joys of food, wine and good company. A friendly competition set amid Palmetto Bluff’s spectacular neighborhoods and nature trails, the HAIR OF THE DOG 5K ROAD RACE finishes at a Bloody Mary bar. Cheers! THE CULINARY FESTIVAL is the big show, the icing on the cake, the cherry on top – a gathering of culinarians, winemakers, growers, and artisans, brought together to accentuate the abundance of ingredients from our surrounding waters, woods and local farms. You’ll enjoy the finest nibbles and nectars, cooking demonstrations, and live entertainment. $25 for every ticket goes directly to Second Helpings, a Lowcountry organization dedicated to ensuring that no one in our community should have to worry about whether or not they will have enough food to eat today. Visit musictoyourmouth.com for the full schedule of events.